Black Pepper, often known simply as the “peppercorn” comes from the Piper nigrum vine, native to India and tropical Asia. The berries are picked while still green, then washed and dried, causing them to take on their signature cratered black appearance. Peppercorn was so important that it made it to the resting place of Ramesses II in the 12th century BC and it was widely beloved in Rome during the 1st and 2nd centuries AD. It was even used as a currency. By the age of Exploration, it came to dominate the spice trade, and while once only in the afford of the rich, black pepper is so quotidian that it appears on nearly every table alongside salt. 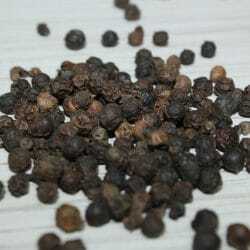 Piquant, spicy and warming, black pepper remains a popular ingredient in gin.